Surely an entry must have an exit; there is no doubt about that. Black holes swallow huge amounts of matter as they travel through space, but where does all that material go? or a indefinite amount of time, otherwise we probably wouldn't be here right now. 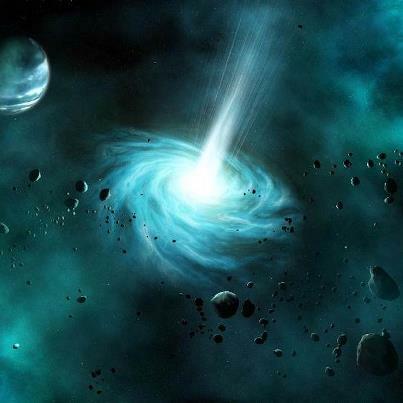 Therefore, astrophysicists invented the concept of white hole. A white hole, in general relativity, is a hypothetical region of spacetime which cannot be entered from the outside, but from which matter and light have the ability to escape. In this sense it is the reverse of a black hole, which can be entered from the outside, but from which nothing, including light, has the ability to escape. 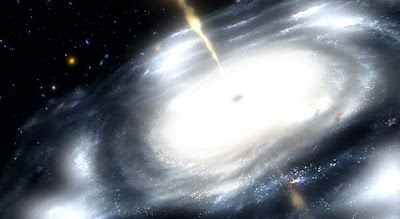 White holes appear in the theory of eternal black holes. In addition to a black hole region in the future, such a solution of the Einstein field equations has a white hole region in its past. However, this region does not exist for black holes that have formed through gravitational collapse, nor are there any known physical processes through which a white hole could be formed. According to the Theory of General Relativity, the acceleration force is invariant under time reversal conditions, thus both the black holes and the white holes have powerful gravitational fields which attract matter, and however they are differentiated by their behavior at the event horizon. While black holes swallow material, white holes eject it. World famous physicist Stephen Hawking, often called the successor of Albert Einstein, argue that if the quantum effects are taken into consideration these seemingly different objects are actually one and the same.Matter drawn towards the white hole can never cross its event horizon, as the previous recedes from it at local speed of light. Any infilling matter which previously crossed the event horizon is ejected towards infinity after it approached the point-like singularity at an infinitely small distance, as the white hole is being destroyed. Black holes were first predicted only a few days after Einstein released the Theory of General Relativity by German physicist and astronomer Karl Schwarzschild as a solution to Einstein's field equations, while trying to calculate how massive a object must be before the gravitational acceleration on its surface exceeds the speed of light. Sadly after publishing his work, Schwartzschild died in the First World War while serving in the German Army. Schwartzschild's solution to Einstein's field equations also predicts the possibility of faster than light travel through Schwartzschild wormholes. Material drawn in by a black hole may travel through a wormhole structure and emerge in another part of the universe through a white hole. Nevertheless, such wormhole has been proven to be extremely unstable, disconnecting between the two massive objects as fast as it forms. Furthermore, the second law of thermodynamic strictly forbids such actions. Some astronomers even suggested the white holes might be responsible for the Big Bang event, more that 13.7 billion years ago which created the universe. Such types of white holes fed from a higher parent universe would be completely different from the traditional view of a white hole through the fact that it cannot be localized in space and its event horizon would surround a volume equal to that of the visible universe.Like black holes, white holes have properties like mass, charge, and angular momentum. They attract matter like any other mass, but objects falling towards a white hole would never actually reach the white hole's event horizon (though in the case of the maximally extended Schwarzschild solution, discussed below, the white hole event horizon in the past becomes a black hole event horizon in the future, so any object falling towards it will eventually reach the black hole horizon). In quantum mechanics, the black hole emits Hawking radiation, and so can come to thermal equilibrium with a gas of radiation. Since a thermal equilibrium state is time reversal invariant, Stephen Hawking argued that the time reverse of a black hole in thermal equilibrium is again a black hole in thermal equilibrium. This implies that black holes and white holes are the same object. The Hawking radiation from an ordinary black hole is then identified with the white hole emission. Hawking's semi-classical argument is reproduced in a quantum mechanical AdS/CFT treatment,where a black hole in anti-de Sitter space is described by a thermal gas in a gauge theory, whose time reversal is the same as itself.